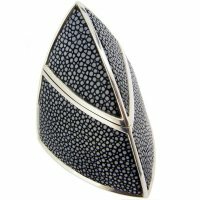 Shagreen inlayed sterling silver box 85mm entirely hand made by James Dougall the award winning silver designer and silversmith. Fascinating with asymmetrical forms and geometry. Every piece is made to the highest standard and also to ensure that each piece is unique. The shagreen that comes from sustainable sources of Ray Skin from Thailand and India and as such are not a restricted animal product under the CITES agreement. The colours are the familiar Green along with Red, Black and Blue. Each one of the shagreen covered boxes contains 32 individual parts all cut, formed and assembled using traditional hand working skills, with final polishing being the only element of manufacture that relies on mechanical means. 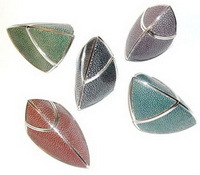 The Shagreen inlayed Jewellery is hand made in James Dougall’s workshop. It is the definition of ultra modern fine fashion jewellery. Each piece is unique and the design allows for the full visual effect of the rare and valuable ray skin used to take centre stage. Exhibited at Goldsmiths Hall, London in 2010’s Craftsmanship and Design Awards. James work exemplifies classic silversmithing with a fresh and unusual approach to design that seeks to redefine the way silver is viewed and used.